Here we are: season three of The Voice. This isn’t going to be a post about the premiere; if you’re looking for that, you need to head over to my episode recap. This is a blog about what it’s like to be a part of the experience. For those of you who are just joining me, I look at the show differently. For me, it’s a lot more than a singing competition; it’s where I met my hero, made some of my best friends, and got the guts to form a band, just to name a few things. As I start Season 3, I’m starting out on an amazing journey, again. The Voice has given me countless amazing experiences. When I first started on the show, all I wanted to do was shake Adam Levine‘s hand and thank him for inspiring me; I couldn’t have imagined that we’d meet each other multiple times, and that he’d become my biggest supporter. I’ve had the chance to learn from the man I consider to be the best musician on the planet Earth. I can’t tell you how cool it is to have Blake Shelton make a point of coming over to say hello to me when he sees me. I’ve stood backstage with Maroon 5 and sung with Beverly McClellan. This is one of the biggest shows on TV, and I’m not going to say it hasn’t been fun. The most rewarding thing, and the reason why I keep coming back, is that I’ve seen firsthand that what I’ve done on The Voice has helped others. Sometimes it’s writing an article or an interview, but more often than not, it’s just being there. I’ve shared laughter and tears with so many people over the last two seasons. We’ve seen each other through both the amazing nights and the difficult ones. Everyone I’ve gotten to work with on the show has honestly become like a surrogate family to me. It means the world that I’ve then been able to make a positive impact on their lives. I take my honorary title as the official extra (now 17th) member of Team Adam seriously. Standing with my coach, even if it’s only in spirit, means something to me. 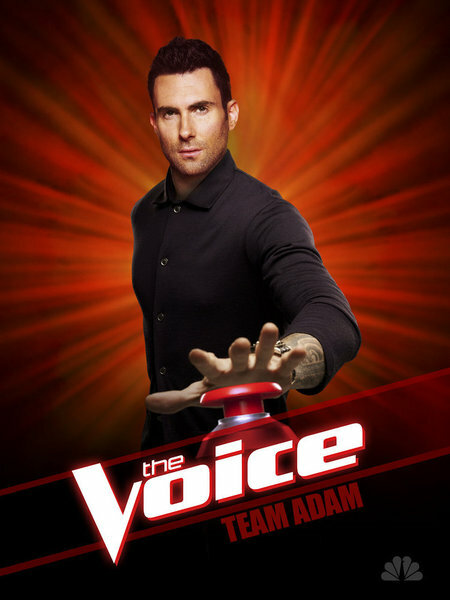 I hope that I make Adam proud again this season, and that I prove that I belong with this third generation of Team Adam, and Team Voice. That’s what matters to me. People have asked me how I balance that with my actual, paying job, which is to report on The Voice. The truth is, it’s not that hard. Just because I’m reporting doesn’t mean that I can’t be compassionate, and just because I’m being compassionate doesn’t mean that it’s going to change what I report. But I’m always conscious of the fact that while The Voice is a TV show, within that show we’re talking about people’s hopes, dreams and careers, and that I’m standing there watching their lives change. That’s something to be taken seriously, and it’s something that changes me as well. This morning I did my first conference call with the new artists, but until I actually meet them and interact with them one-to-one, I’ll be nervous about fitting in. Yet I remind myself that’s how I felt going into Season 2, and I ended up making twenty-something new friends out of it. In fact, as I type this, I’m already missing Justin Hopkins and how he always makes me laugh, and Jamar Rogers and his amazing hugs, and my first real friend on the show Nathan Parrett, and…well, everyone! I’m just going to cross my fingers and have faith that Season 3 is going to be just as special as Season 1 and Season 2 were. Whatever happens, I can say that I’ve had the experience of a lifetime at least twice, and that’s a blessing that I’ll always be grateful for. ← ‘The Voice’ News Roundup: Have You Heard The New Singles Yet? !